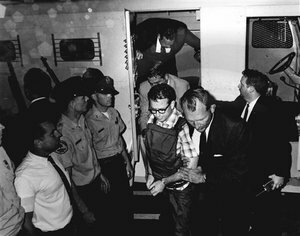 Today marks the 43rd anniversary of the assassination of Martin Luther King, and last week a cache of photos of King’s killer, James Earl Ray, were released by the Shelby County (TN) Register’s Office. The photos, along with old documents and letters, were housed in a Memphis warehouse and recently uncovered. As the AP reports, the photos, taken by Memphis photographer Gil Michael, aren’t revealing or shocking, but they are interesting to see given the significance of the event. Most have never been seen by the public before. The Shelby County Sheriff at the time, Bill Morris, had the photos taken to show that Ray was not being mistreated while being booked. You can see nine of them on the website of the Commercial Appeal. By the way, if you’re ever in Memphis, the Lorraine Motel has been turned into the National Civil Rights Museum, and it’s well worth a visit. In addition to other artifacts and memorabilia from the time, they’ve preserved the room King was staying in before his murder.